Massive machine-type communications will aid in the development of the "internet of things," the network of interconnected devices embedded in everyday objects that share data, as well as smart devices, sensors and industrial equipment that uses the mobile network. Many of these devices do not require ultra-low latency (the amount of time it takes to send a message through the system and for the receiving machine to follow instructions) since a sensor might only send data every hour. However, the 5G network will improve the functions of such devices, especially if many of them are located close to each other physically. Ultra-reliable and low-latency communications will form the backbone of new applications. 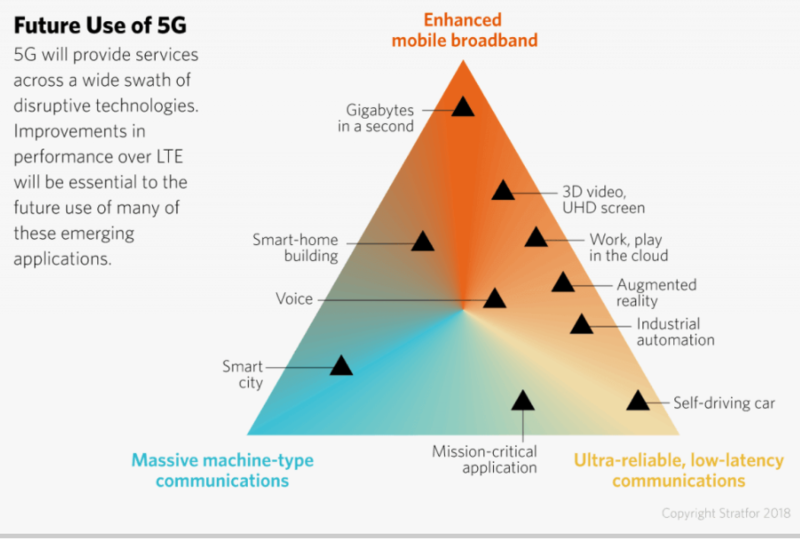 The goal of 5G networks will be to increase reliability and reduce latency to less than 1 millisecond, which is far more rapid than the comparatively sluggish figure of 25 milliseconds – even in ideal conditions – for existing 4G technology. Accordingly, ultra-reliable connections could become instrumental for “mission critical” applications due to the effective elimination of any element of risk. Low-latency connections will lead to the greater usage of self-driving cars, as well as the tactile internet, which will enable people to control objects remotely as never before. The tactile internet, for instance, could soon allow surgeons to perform operations from thousands of miles away in real-time. Beijing has opted for an international approach to development and deployment of 5G. China has assumed a pioneering role in various international organizations that are developing the standards to underpin 5G technology, such as the 3rd Generation Partnership Project – the organization that facilitates collaboration by industry participants on telecommunications standards – and the International Telecommunication Union. Carriers whose operations are restricted to a handful of countries often operate the world’s current mobile telecommunications networks, unlike the basic equipment that is central to the telecommunications industry. Radio access network technologies, such as antenna base stations, core chipsets, and mobile handset/smartphone devices, are produced in a globalized market, ensuring a high degree of standardization and interoperability on a worldwide level. This time, Beijing appears to have learned from the past. China is hoping to lead from the outset on 5G by helping set standards that are better-suited to Beijing’s desires for the network, thereby allowing it to leap ahead of its many global competitors. China could push for parameters that emphasize the industrial applications of massive machine communications and ultra-reliable low-latency communications over the media applications of enhanced mobile broadband, which means focusing less on the millimeter wave band – part of the spectrum above 24 gigahertz – and more on a system called Massive Multiple In Multiple Out, under which there could be hundreds of antennas and receivers operating from the same base station, instead of the current two to four antennas. But Huawei and ZTE are not Washington’s sole concern. 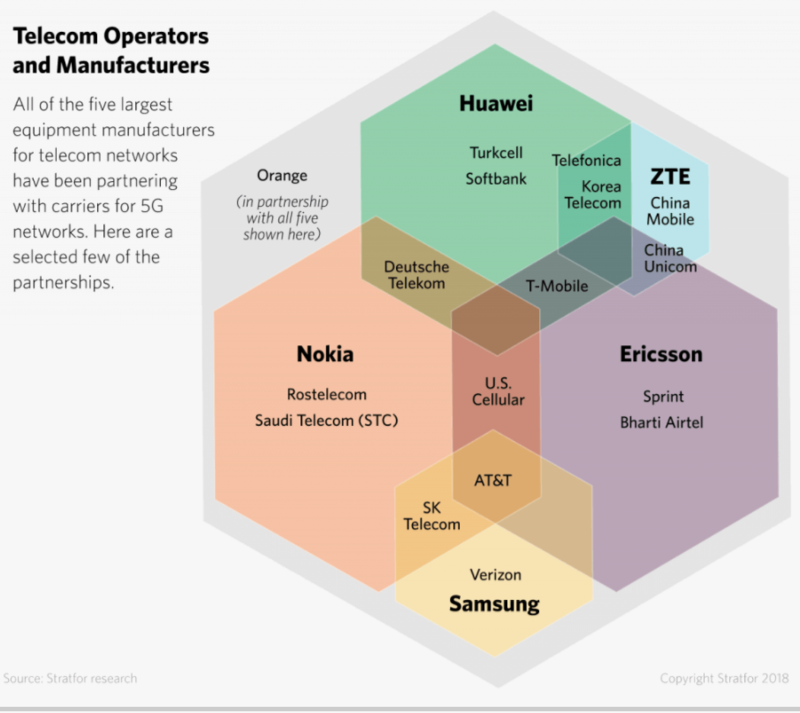 While U.S. firms like Intel and Qualcomm are critical players in the 5G system overall, the United States does not have a major domestic manufacturer of 5G radio access network hardware. 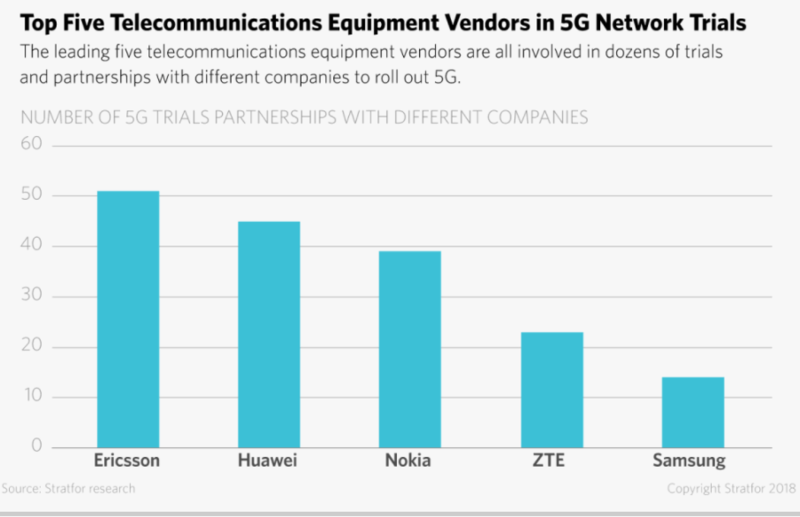 Accordingly, the United States is voluntarily walling itself off on 5G by eschewing Huawei and ZTE, since there are only three other companies, Samsung, Nokia, and Ericsson, that are currently exploring end-to-end solutions for 5G. But it is not just nations that are battling over technology like 5G; many global giants in the industry – some hailing from the same country – are fighting each other for the chance to develop the new networks. Intel and Qualcomm, which have been rivals for decades, are now both important competitors for 5G technology, especially in the design of computer chips for various devices and base wireless technologies, like waveforms. Both will also earn lucrative royalties from patents, with Qualcomm frequently earning royalties even when its chips are absent from a product because it holds the patents in the corresponding wireless technology. In the end, Qualcomm wishes to earn as much as $16.25 per 5G smartphone as a result of its patents. The company, however, has become a political hot potato since it mired itself in a number of disputes with rivals over its royalty-dependent business model. In February, Qualcomm announced that 19 global carriers and 18 original equipment manufacturers had agreed to select the Qualcomm Snapdragon X50 5G modem for their first rollout of 5G devices in 2019. 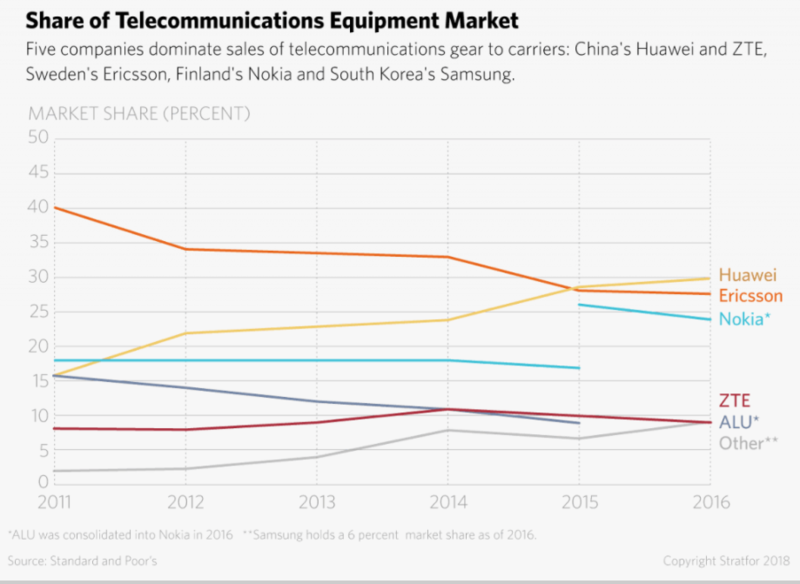 Apple, Samsung, and Huawei, however, were not among any of the 18 manufacturers, even though the three firms accounted for 45.3 percent of the worldwide market share for smartphones last year. 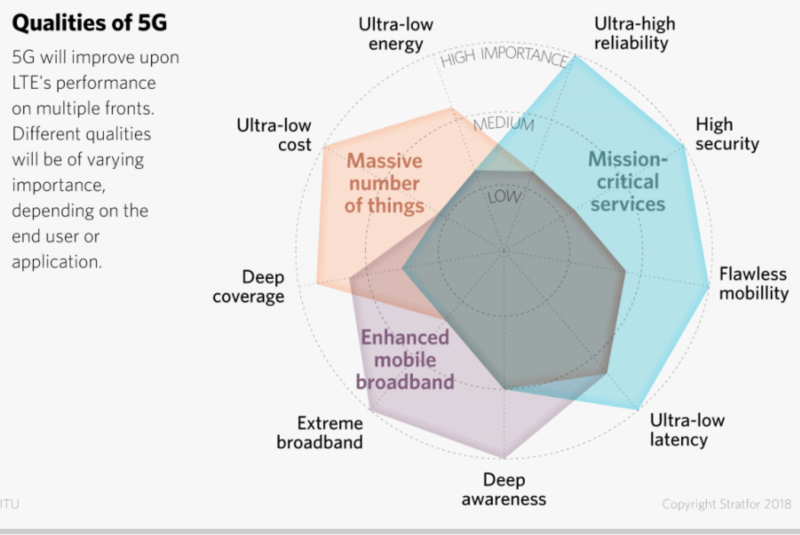 The U.S., China, and Others Race to Develop 5G Mobile Networks is republished with permission from Stratfor.com.